Thousands of Indians were enslaved and killed during the rubber boom. Casement was sent by the British government to investigate crimes committed by British-registered rubber giant, the Peruvian Amazon Company. He found, ‘The crimes charged against many men now in the employ of the Peruvian Amazon Company are of the most atrocious kind, including murder, violation, and constant flogging’. Much of the detail of this horrific episode has been forgotten, but for the descendants of the rubber boom survivors, the reality of the continuing ‘rainforest harvest’ is impossible to ignore. 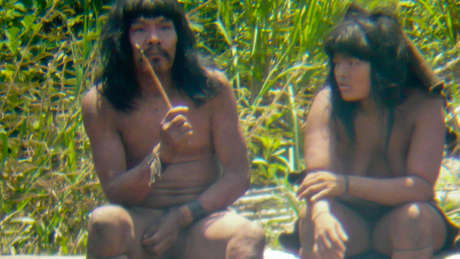 The uncontacted Indians seen in stunning new footage last month are likely to be descended from rubber boom survivors, whilst nearby another ‘rainforest harvest’ is being played out on uncontacted tribes’ land. Illegal loggers, driven by the high value of endangered woods, are pushing further into their remote forest homes. US conservation organization, Upper Amazon Conservancy, documented illegal logging camps in areas inhabited by uncontacted Murunahua Indians just six months ago. Yet, according to a statement by Peru’s environment minister last week, the government has logging under almost 100% control. ‘Each mahogany tree that is chopped down today is georeferenced and controlled’.